The Rev. Simpson was inducted on 4th January 1950. His ministry was one of progress with flourishing organisations and enhancement to the Church buildings. In 1950 the Women's Guild celebrated their 21st birthday with a large party for 300 guests. The Brownies held the shield for Central Fife in 1951 and were presented with the County Trophy. The Girl Guides won first place in the District Competition the same year, and again in 1955, and the Boys' Brigade celebrated their Silver Jubilee. 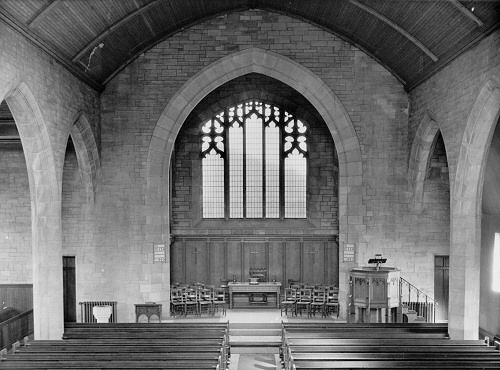 This view, above, of the inside of the Church is prior to the installation of the new stained glass window in the late 1960s. The Bible Class had approx 100 members who regularly held meetings with other local Churches at the old St. Brycedale Mission Hall in Coal Wynd. They had famous speakers such as Rev. Prof. Donald Baillie and James Stewart. The Youth Fellowship put on Easter and Nativity plays which were sometimes repeated at the Victoria Hospital. This also included participation in the hospital pageant with or without a float. In 1953, over 400 children attended Sunday School. A special jubilee social was held in the Beveridge Hall to celebrate the laying of the foundation stone, this being held on 18th September 1957. In 1958 special services were held to celebrate the 50th anniversary. The growth of Kirkcaldy during the 50 years now meant that the Church was in a central position surrounded by new streets and houses. During 1959, the new transept was dedicated to those who lost their lives in World War II, thus completing the shape of a cross. It was complete in 1960 and fitted with the bronze memorial, shown below. 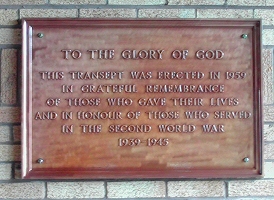 This memorial is now to be found on the rear wall of Bennochy Church, in the new Church building. In 1965, fund raising was started for a stained glass window which would eventually be complete in 1969. Also in 1965, the practice of seat-letting ("sittings") was abandoned. This was the normal practice of renting out pews to families for their use which were marked with the family name. There were also many unmarked pews for the 'poor of the parish'. In 1967 the kitchen and cloakroom were extended to cater for the needs of the growing organisations. The musical history of the Church continued with many concerts, operettas and musical evenings held in the halls. The Junior Choir, and others, staged "The Doll's Hospital", "The Charcoal Burners", "The Magic Flute", "The Spell" and "The Sound of Music".